HIROSHIMA, Japan -- Convinced that the time for this moment is right at last, President Obama on Friday became the first sitting American president to confront the historic and haunted ground of Hiroshima. The president touched down in Hiroshima Friday morning after completing talks with world leaders at an international summit in Shima, Japan. Mr. Obama and Japanese Prime Minister Shinzo Abe entered the Hiroshima Peace Memorial Museum, where the American leader signed a guest book. 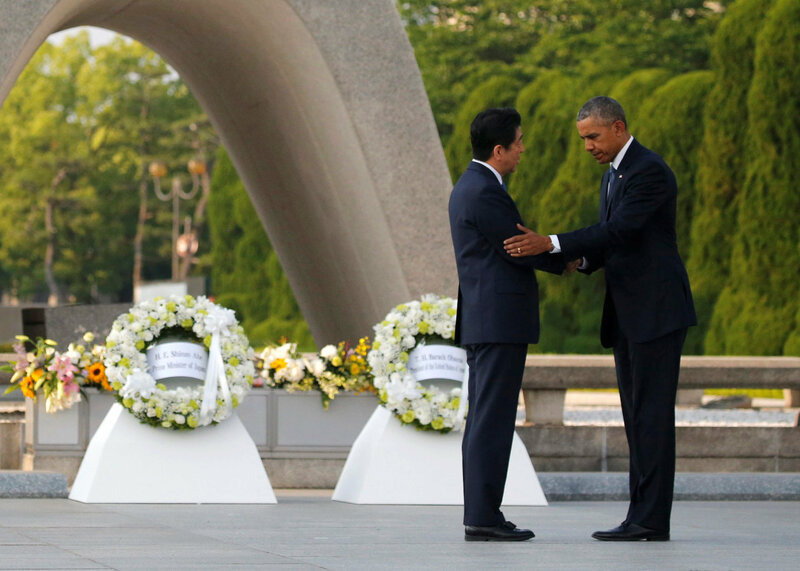 Here, at this place of so much suffering, where U.S. forces dropped the atomic bomb that gave birth to the nuclear age, Mr. Obama paid tribute to the 140,000 people who died from the attack seven decades ago. He did not apologize. He did not second-guess President Harry Truman's decision to unleash the awful power of nuclear weapons. He did not dissect Japanese aggression in World War II. Rather, Mr. Obama aimed to offer a simple reflection, acknowledging the devastating toll of war and coupling it with a message that the world can -- and must -- do better. He looked back, placing a wreath at the centopath, an arched monument in Hiroshima's Peace Memorial Park honoring those killed by the bomb that U.S. forces dropped on Aug. 6, 1945. A second atomic bomb, dropped on Nagasaki three days later, killed 70,000 more. Mr. Obama also looked forward. He said the world has a shared responsibility to ask how to prevent the suffering that took place in Hiroshima 70 years ago from happening again. Speaking alongside Abe, Mr. Obama said the memory of Aug. 6, 1945, "must never fade," and that it allows the world to fight complacency and fuels a common moral imagination. He's also called for a reduction in nuclear stockpiles and a move toward a world without nuclear weapons. The Reuters news agency notes that, "The visit has stirred debate, with critics accusing both sides of having selective memories and pointing to paradoxes in policies relying on nuclear deterrence while calling for an end to atomic arms." The president was accompanied during his entire visit by Abe -- a demonstration of the friendship that exists between the only nation ever to use an atomic bomb and the only nation ever to have suffered from one. Bomb survivor Kinuyo Ikegami, 82, paid her own respects at the cenotaph on Friday morning, well before Mr. Obama arrived, lighting incense and chanting a prayer. Tears ran down her face as she described the immediate aftermath of the bomb. "I could hear schoolchildren screaming: 'Help me! Help me!'" she said. "It was too pitiful, too horrible. Even now it fills me with emotion." Han Jeong-soon, the 58-year-old daughter of a Korean survivor, was there too. "The suffering, such as illness, gets carried on over the generations -- that is what I want President Mr. Obama to know," she said. "I want him to understand our sufferings." A handful of survivors were at the Memorial Park on Friday to hear President Obama speak, and he met two of them personally after giving his brief remarks. Mr. Obama spoke first to Sunao Tsuboi, the 91-year-old head of a survivors group, and then Shigeaki Mori, 79, a historian who was just 8 when the bomb detonated on Aug. 6, 1945. The president and Tsuboi laughed at one point, the president throwing back his head and smiling broadly. Mr. Obama mostly listened, though, holding the elderly man's hand in his own, an interpreter standing nearby. Tsuboi stamped his cane emphatically while speaking. Mr. Obama then stepped to Mori and shook his hand. He bowed his head briefly and nodded as the man spoke. He patted Mori on the back and hugged him as the survivor shed a few tears. Mr. Obama's visit is a moment 70 years in the making. Other American presidents considered coming, but the politics were still too sensitive, the emotions too raw. Jimmy Carter visited as a former president in 1984. Even now, when polls find 70 percent of the Japanese support Mr. Obama's decision to come to Hiroshima, Mr. Obama's visit is fraught. His choreographed visit will be parsed by people with many agendas. There are political foes at home who are ready to seize on any hint of an unwelcome expression of regret. There are blast survivors who want Mr. Obama to listen to their stories, to see their scars -- physical and otherwise. Mr. Obama will try to navigate those shoals by saying less, not more. Before visiting the site of the bombing, President Obama stopped first on Friday at the Iwakuni air station, a short helicopter ride away from Hiroshima, where he visited U.S. and Japanese troops. He told them his historic visit was a chance to reaffirm a commitment to pursuing a world where nuclear weapons aren't necessary, and he praised the troops for their sacrifices to ensure the security of people around the world. He said the world mustn't forget to honor those who have given everything for freedom.